The winter routine has settled in here at the farm as we batten down, give everything a deep clean and make long lists of what to organize, repair and replace. Farming in the north is a privilege in many ways but this time of year makes me so thankful to that we have a couple months to “pull the ship out of the water” (unlike our California or Florida friends who just keep cranking away). About half of my December days are spent crunching the books from the closing season, finalizing budgets for the year to come and getting our seed orders sent off. This process of reflecting and reimagining, stitching two years together, is very satisfying (especially when the seeds start to arrive). The other half of my days this month are spent working with Kristin and Virginia who are here part-time through much of the winter. 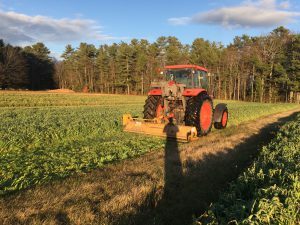 They are working through these last few snow-free weeks mowing fields, breaking down field tunnels and pulling row fabric. As a group we will do many things like inventory our seeds on hand, re-wire the greenhouse, repair and endless list of machines and weld up a whole mess of new racks for moving transplants. We have had nice regular rain the past couple weeks and while we haven’t caught up the ground is wet and the farm waterways are moving. Refilling our water table (which for us is the massive Brunswick Aquifer) is vital to us maintaining soil microbiology and fertility. A good snow load would be really helpful in keeping the positive trend moving in the right direction. I know I’m not popular when I say this but, BRING ON THE SNOW! We are two pick-ups into our late fall share and the response for those who signed up has been overwhelmingly positive. 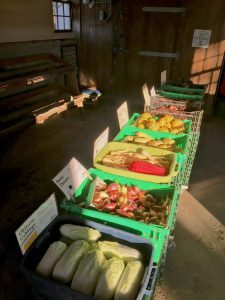 It’s lots of great storage produce like squash, beets, cabbage and carrots along with greens from our field tunnels. Everyone’s bags have been very full on the way out the door. We hope to expand this program next year. Look for sign-up option coming next month. Thank you to all of you who have signed up with us for 2017. 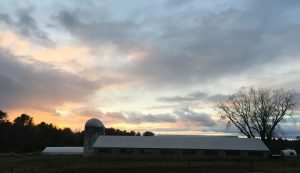 Your support now is so important as we have already started dipping into our 2017 budget with potting soil from Vermont, greenhouse and tractor biodeisel (from the best deep fat fryers in Portland) and seeds from Maine suppliers (Johnny’s and FEDCO). As a member of this CSA, your family and the farm are linked. 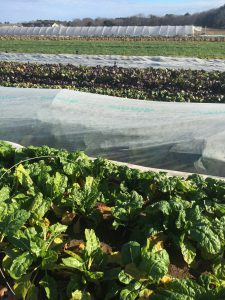 Your memberships now provide cash flow throughout the season and allows us to focus on growing the best food. If you have not signed up yet but would to here’s the Brunswick link and the Portland area Delivered share link for our easy online system. *NEW THIS YEAR – For those who like to pay via credit card online, we now use a system that will AUTOMATICALLY charge your credit card. When you sign up and enter your credit card information, you will be charged at that time ($113 for Brunswick On-Farm Share, $115 for Delivered Share) , and then it will automatically charge that same amount ($113 or $115) until your balance is paid. We put many hours into this new system and hope it makes the payment plan process easier for all.